Perhaps the most natural return to form for me would be to write reflexions of a Sion Sono film. As assuredly you all know, Sion Sono is my personal favorite auteur, with his each and every film reaching beyond the boundaries of reality returning with visual prose of weightiness. Pairing his talent of avant-garde poetry with the camera was a match made in heaven, whatever that may be. Following Suicide Club 6 years in the making is Exte, an idea that must have stemmed from a deleted subplot in Suicide Club. During the trailer of Suicide Club exists a scene in which blood and hair protrude from a printer in grotesque fashion. Seeming all too surreal for the very [sub]rational elements within Suicide Club, this attention to the supernatural with digital dreads would have made for Suicide Club to be rebranded entirely. Not just teetering on subliminal messaging but mechanical possession? Why, it seemed only logical to take his scorned ideas and to mutate them into something else - Exte, the greatest horror satire that was ever to be. 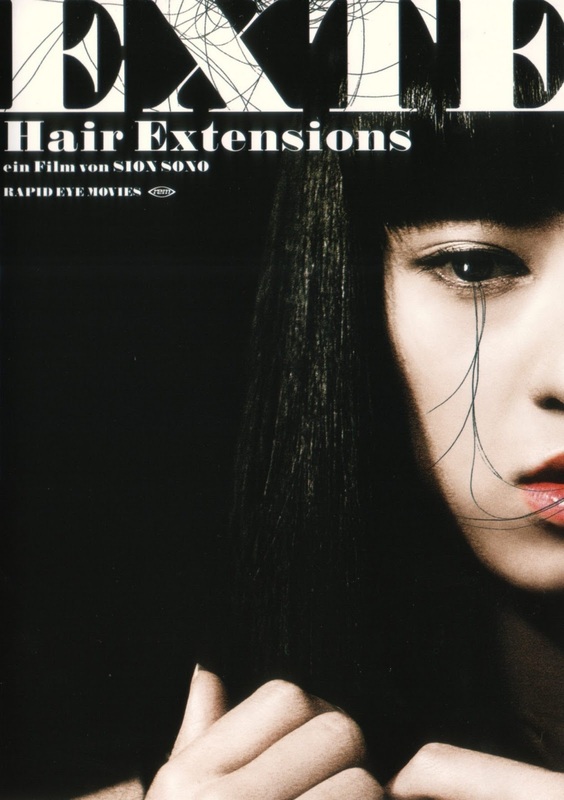 Starring Chiaki Kuriyama (Kill Bill, Battle Royale) and Ren Ôsugi (HANA-BI, Audition), Exte: Hair Extensions is a wild, trope-smashing migraine of Japanese horror cinema. Ostensibly too muddled and tongue-planted-too-firmly, Exte has but been exiled into scraps of J-Horror excess which serves as every bit a crime as child abuse is. Exte is certainly nasty business, all involving the fine undead follicles of a dead girl. You'd hope Sono's "extensions" of horror would be safe from phobias. Well you can say goodbye to that notion as Sion Sono gives us another reason to fear physicality and being. Scenes to mention would be when a hairdresser discovers a strand of hair distending from beneath her eyeball. Grasping softly and tugging, the tension on the strand of hair has enough impact as to leave even the most jaded gorefiend emphatically wringing their fingers and begging for the images to succumb to a tone lighter than its current. On a strict plot basis, Exte is too weird for its own good, that is, this disjointed exhaustion of traditional Japanese curses and crude possessions is every bit bizarre as the mental image of a decomposing body's wounds exuding tufts of hair would be. 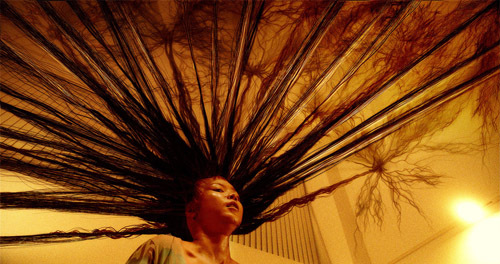 A trichophilic morgue watchman, whose activities involve trimming the hair of the recently deceased to create hair extensions, discovers the corpse of a young girl whose organs were harvested by Yakuza and due to her flowing raven locks, Yamazaki steals the body and takes her home. This is just where the madness begins though. As the body appeared in a shipping box of hair, you might assume that this hair is a collection but her rage in an unhampered fashion may prove otherwise. Sion Sono doesn't answer these questions you might have. The terrible fate of the girl is hinted at during short, soiled segments. Exte would just rather tell the story of an inspiring hair stylist and her abused niece. Now from the standpoint of a Sion Sono enthusiast, Exte is his most critically shamed film to date. I've had several like-minded fans of his auteur signature tell me that Exte really didn't contain all too much worth spare a couple scenes of hair-terror. I was colored very surprised, though, with Exte as it continues Sono's reign as king and proves to be his most established and separate taste to date. I have always witnessed Japanese films attempting to fit the mold of a direct, picturesque adaptation of manga to the screen. It is the Eastern equivalent of Hollywood buckling towards comic books aesthetics which you have seen in Punisher: War Zone and less-effectively, Zach Snyder's Watchmen. To be honest, the most recent of these films turned ink would be Hobo with a Shotgun. The inky pastels of blue and yellow taint the screen and create for an unsettling backdrop for the extreme violence. In Japan, many films have struggled to suit such a label including Ichi the Killer, Marronnier, and Uzumaki, just to name a few. Granted, these ideas seem more in tune with comics because several are based off of such and not just splashed with tinges of vibrant colors. With that in mind, Exte is the closest I have ever seen the medium of film succumb to a comic sickness. Ren Ôsugi's portrayal of Yamazaki is worthy of the film textbooks. Yamazaki is a character that, to an intellectual level, can only be described as batshit insane and no amount of brooding upon the volume of raven black hair can change that asset of his character. Returning to the idea of a Suicide Club with technologically inclined spirits, Japanese horror cinema has been all about "grudges". In their market lies much room for mistakes. Catering entirely to the feeble-minded cowards of the West, it is hard for me to believe that anyone in the land of the East takes their own horror genre seriously. After all, the only atmosphere to be found is ample servings of soft focus and pajama garbed girls with knotted wet jet-black hair. In that instance in which the hair parts ways with raw data and projects itself out of a machine, I felt inspired to write about Exte, a film that has undeservedly been cast out among the Tartan filth of global cinema enthusiasts. Exte cannot be grouped up with any Kairo or its more suited companion The Wig. No, Sion Sono's Exte is all his own creation. Even the beauty shop comedic elements to this tale of sisterhood comes as a sigh of fresh air. I have spent so long avoiding J-horror for all of my worth when, in the process, I had foolhardily swept Exte under the rug as well. Not just for its extra-dimensional static cling, Exte is a unifying reason to pity the dead. That single tear escaping from the empty socket of a once beautiful girl marks the existence of a soul, which, even if in cinema, gives me some hope for an after-life. Exte: Hair Extensions is skin-crawling with emphasis applied to every syllable. Sion Sono borrowed the game just to humiliate the "masters" and further solidifies his placement on a pedestal. A pleasure to meet likewise Sono fans. I hope you're kind to Exte as so many people aren't. Good to see someone else giving Sono some love. Have you seen his film Noriko's Dinner Table? I had rented it via Netflix about a year ago. Tried giving it a sit through but never watched through completion. Is it worth revisiting? It is very hard to get through, but by the time that intense ending comes along you definately feel like you made the right choice by sticking it through. How funny, when i first saw EXTE i did not watched through completion (i had now, and loved it like every sono's work.). When i saw Noriko's i watched it until the end and it had this converstation about places and roles in society which i loved so much, i would like to see a review of it at soiled cinema. Definetly worths revisiting, nothing in my case will be better than love exposure but it was really good.